"Custom Art Paintings on Birch Panel"
Born in Poland, in the historic town of Brzeg, Andrzej grew up during the years of political oppression and era of communist Poland. There he attended the School for the Arts and Literature. Unconsciously, these primary years were the platform for a deep attraction towards peace, poetry and art as a form of creative preservation. In 1984, Andrzej moved to New York and continued his education at the School for the Arts at Jersey City State University. While he was earning him a BFA in painting, Andrzej had the opportunity to explore everything from sculpture to printmaking, drawings to graphic art. These years were pivotal processing years. At the end of the 5-year BFA program, Andrzej earned a Master’s Degree and Honorary Award in Urban and Landscape Architecture from the University of Pennsylvania in the field of Urban Architecture in 1994. Architectural design taught him to observe and imitate nature through new media. The rigorous nature of the field transformed Andrzej’s creative approach away from objectifying the world and towards autonomy through painting. 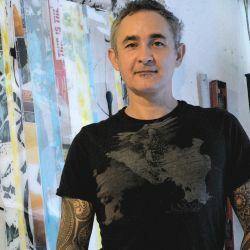 After relocating to the San Francisco Bay Area in 1994, Andrzej’s artistic direction began to take shape after integrating Eastern spirituality into his artwork. For him, Eastern Spirituality and forms of Zen, mediation and Buddhism was closer to seeing world as beautiful rather than violent as he has in his early years. Andrzej’s artistic philosophy led him to resume his academic work at the California Institute of Integral Studies in San Francisco where, in 2011, he received a Masters in Integral Psychology and a certification in Expressive Art Therapy. While Andrzej’s current studio is based in Berkeley, his paintings are currently exhibited Los Angeles, the San Francisco Bay Area, Chicago, Dallas, New York, Boston, Paris, London and Hong Kong. His work is in private collections throughout the United States.